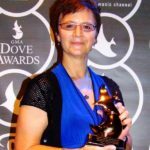 No, that’s not my Dove Award –Just ham­ming it up. Hel­lo, thanks so much for vis­it­ing my site. Here you can find some insight into your favorite Chris­tian music enter­tain­ers and sports fig­ures. My back­ground is sports jour­nal­ism with more than 30 years of expe­ri­ence. I’m cur­rent­ly a copy edi­tor in the beau­ti­ful Rocky Moun­tains. I start­ed cov­er­ing Chris­tian music in my spare time after real­iz­ing the gen­re was large­ly ignored by main­stream media. This web­site is an exten­sion of that. As a novice music writer you will find my reviews of music are from the per­spec­tive of a music lover and not a “expert” on the sub­ject. I hope this helps you and avoids all the gob­bledy­gook found with some review­ers. I have expe­ri­ence at The Den­ver Post, The Atlanta Jour­nal-Con­sti­tu­tion, The Wash­ing­ton Post and The Hart­ford Courant, along with oth­er pub­li­ca­tions, gar­ner­ing numer­ous awards. I came across your blog today as I was look­ing for peo­ple who review new music, and I was won­der­ing if you’d be able to take the time to check out my lat­est album. I’m a Chris­tian indie artist from Kansas, cur­rent­ly liv­ing in Kenya, and because I crowd­fund­ed the whole EP, I’ve decid­ed to give it away. It’s cur­rent­ly list­ed on http://www.noisetrade.com/sambrosiac/my-name-your-seal if you want to take a lis­ten. Thank you for your time and con­sid­er­a­tion. God bless!